If you happened to check out my mini blueberry banana muffins recipe that I posted last week, you probably know that I’m all about the mini cups these days. I don’t think I’ve EVER used my mini muffin tin as much as I’ve used it these past few weeks. It has definitely come in handy for prepping baby meals! And the great thing is, my husband and I have been able to eat everything that I’ve been whipping up too, so it’s not like I’ve been making separate meals just for baby. I really wanted to start introducing quinoa to our baby, but I knew he probably wouldn’t be able to pick it up with his fingers yet since it’s pretty fine and he doesn’t have that pincer grip established… AND he’s still a little clumsy with a spoon. In case you missed my other posts, we’ve been trying out the baby-led weaning method where you essentially skip the puree phase and basically allow the baby to feed himself (you can read more about that here). So I started thinking about an easier way for him to shovel the quinoa into his mouth, without him licking the tray of his high chair, which has totally happened. Did I mention he also tries to eat his toes? Anywayyyys, suddenly it hit me! 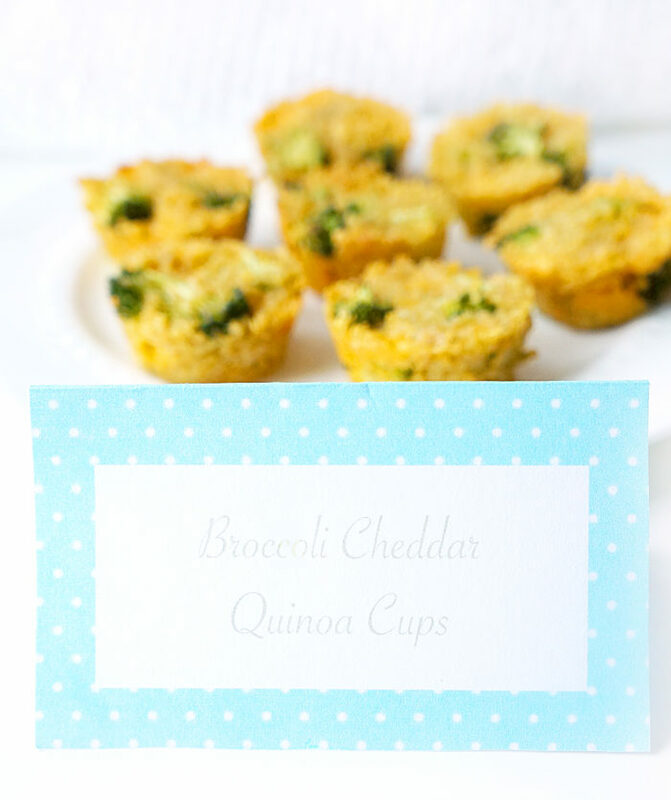 What about incorporating the quinoa into a mini cup?? 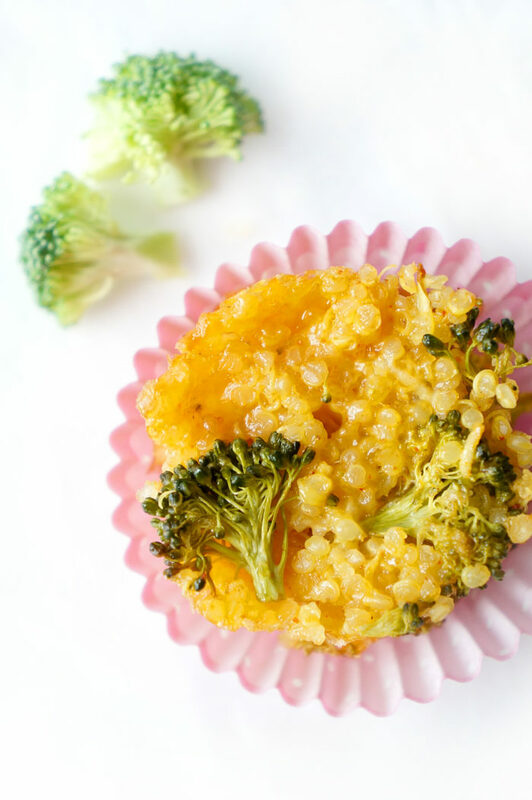 Of course, the only way to bind that quinoa together is with some ooey-gooey cheese, and what goes together better with cheddar cheese than some broccoli?! 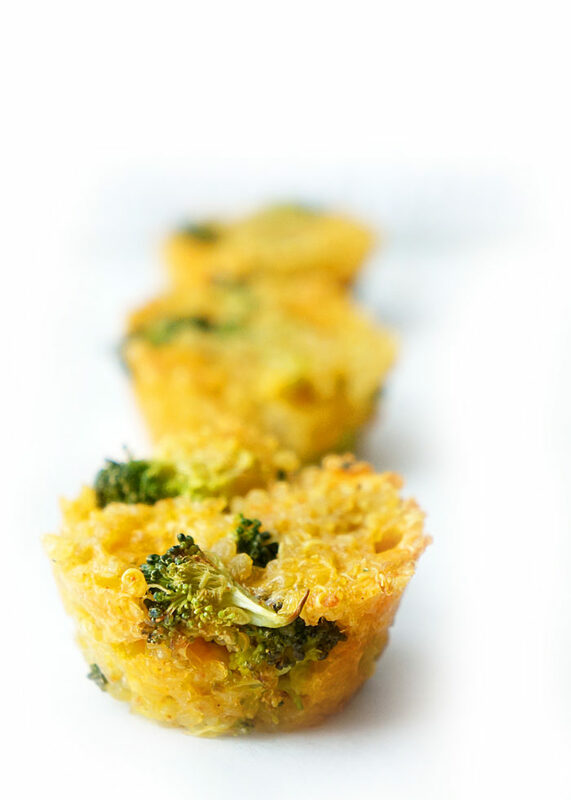 And that’s how these Broccoli Cheddar Quinoa Cups were born! The first time I gave these to our little guy, he seemed to really enjoy them and loved playing with the little broccoli pieces too. 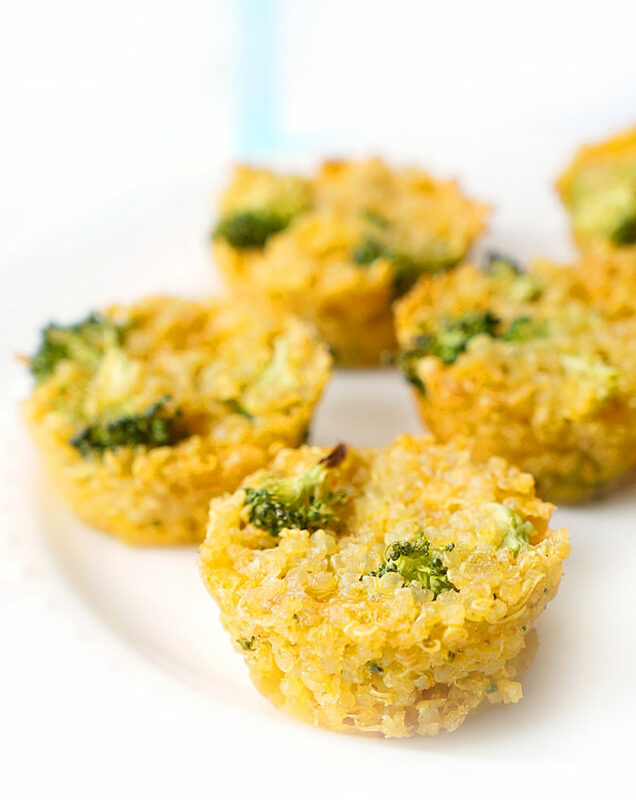 They were easy for him to grasp and I felt good knowing that he was getting lots of nutrients from the simple ingredients in these mini quinoa cups. The ONLY downfall was that Leo smelled like broccoli and cheese for a couple of days (the smell tends to linger for a while #ohwell), but that’s nothing a bath can’t fix! 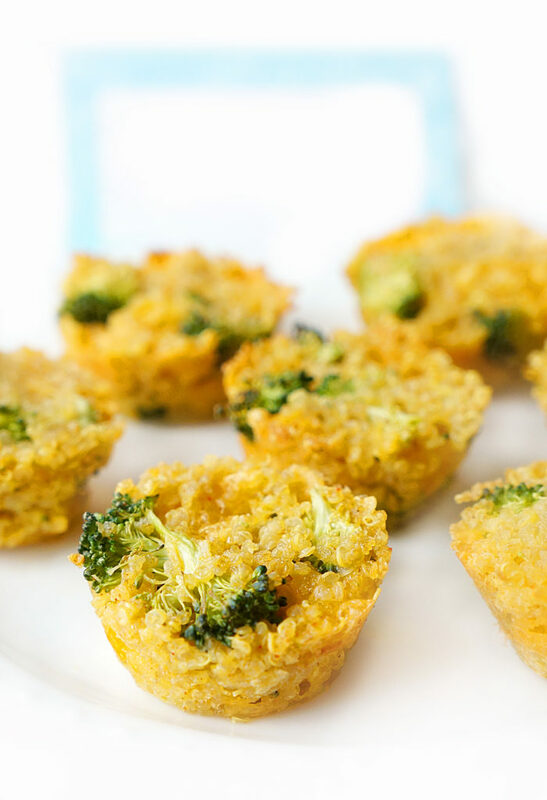 At the end of the day, there’s so many great reasons to incorporate these Broccoli Cheddar Quinoa Cups into family-meal time! 1. Quinoa is a Nutritional Powerhouse – It’s one of the only “grains” (it’s actually technically a seed, but many people lump it together in the whole-grain category since it’s consumed like a grain) that’s considered to be a complete protein because it contains all nine essential amino acids. It contains 8 grams of protein and 5 grams of fibre per one cup serving. A one cup serving also provides 20% of our daily iron requirement and is especially beneficial when paired with the vitamin C-rich broccoli since that can help enhance the iron absorption. Just make sure you rinse or soak the quinoa well before cooking to help reduce the phytates found in the quinoa which can bind to the iron and reduce it’s absorption. 2. Quick & Easy – Quinoa cooks up in less than 15 minutes, so it really takes no time at all to whip together. 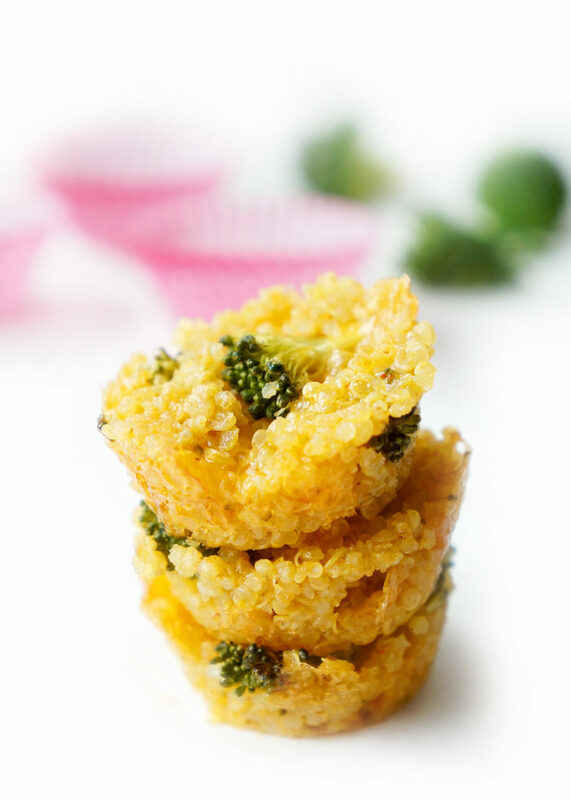 You can even cook up the quinoa in advance and make the cups at a later time so that all you have to do is assemble the ingredients required for the quinoa cups. 3. Kid-Friendly and Fun to Eat – How many of you have tried giving your kid (or husband, for that matter) just straight-up quinoa? No flavouring…just plain ol’ quinoa. I served it to my husband as a side one time, and without saying anything, he made it clear that it wasn’t his favourite thing in the world. Believe me, I can read his signals. THEN I gave him one of these cups and he couldn’t keep his hands off of them. He probably had about five of them for lunch. It’s all about how you serve it up, my friends! These would even make a great meal for those school lunches or an after school snack! I recommend cutting the broccoli pieces for these cups into really small pieces so that one piece doesn’t take over the whole cup. Instead, you get a more equal distribution of mini broccoli bits. Also, by chopping the broccoli into fine pieces, it also helps the quinoa mixture bind together better. I chose to leave out the salt for our baby’s sake, but if making these for older children or adults, you might want to add some in to incorporate a bit of extra flavour. You can eat these cups warm, cold or at room temperature, but I prefer warming them up a bit so that the cheese gets all melty and gooey. Nothing beats gooey cheese! If using a regular mini muffin tin, spray or grease it well to prevent the quinoa cups from sticking to the pan. Better yet, try using a silicone mini muffin tin to avoid the tough clean up! I also recommend pressing the quinoa mixture down firmly into the the muffin tin cups to help them bind together while baking. I like to use a mini spatula for this purpose. And here’s a quick tip! Run it under some water before pressing down on each cup to prevent the mixture from sticking to the spatula. You can store these quinoa cups in the fridge for up to four days. Past that, I would recommend freezing them in a ziploc bag or container. 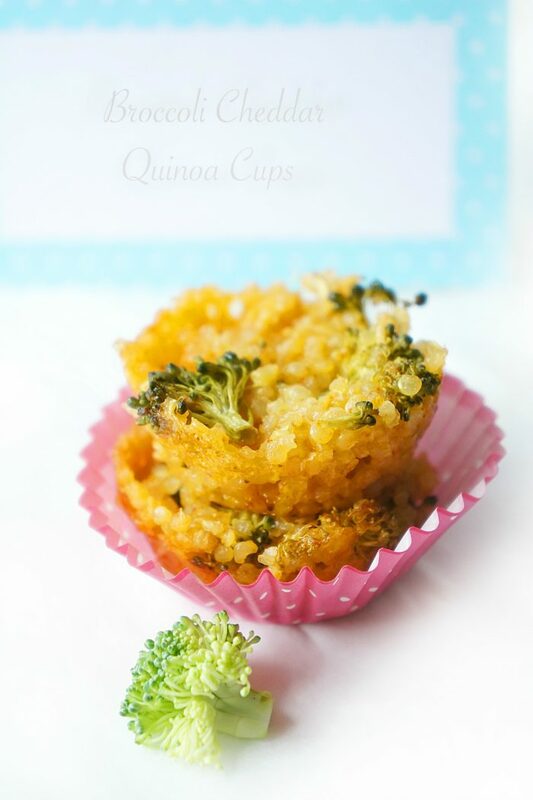 When freezing, simply separate the quinoa cups with parchment paper to prevent them from sticking together. 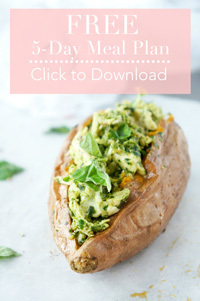 This is the method I’ve been using for my family and it’s been SO convenient to pop a few of these cups out of the freezer and quickly warm them up for lunch along with some extra veggies. Hope you and your family enjoy these cute little cups! Looking for some other great finger foods for babies? Check out some ideas below! 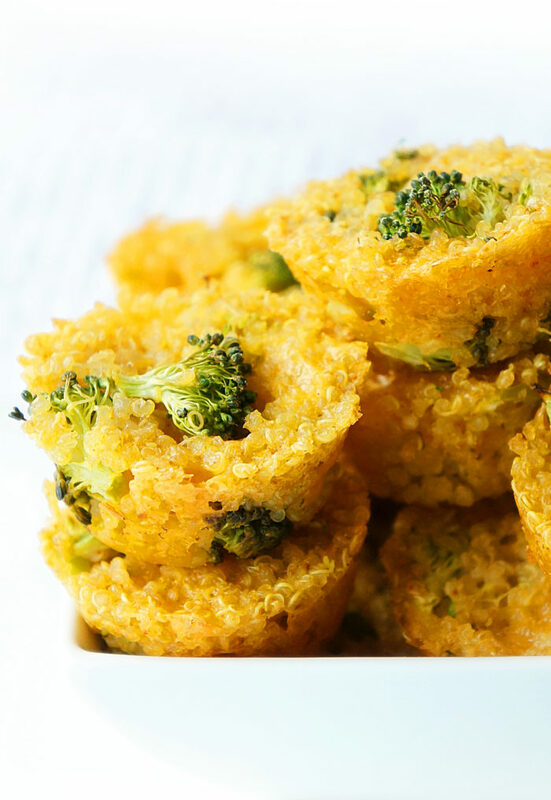 Mix cooked quinoa, broccoli and cheese together. In a smaller bowl, beat eggs, garlic, onion powder and paprika (and salt, if using). Add to quinoa mixture and mix until incorporated. Spray muffin tin with cooking spray or use silicone muffin tin. Divide mixture evenly among mini muffin cups, pressing down with a spatula to pack down. Bake for 15 minutes. Allow to cool for several minutes before removing from muffin tin to allow the quinoa to set. This is a great post! I’m sharing it to Baby Bloom Nutrition on the Facebook page and Pinterest list. I also love this for kids in the kitchen! Thanks so much Yaffi — I appreciate you sharing the post! It’s such a great recipe for little ones!